Mental health problems and disorders constitute an escalating challenge in the workplace. Another chapter in this handbook by Dewa and colleagues has also addressed this important topic. According to the World Health Organization (WHO, 2001a), mental health disorders comprise 40 % of the leading causes of disability worldwide, and they account for 10.5 % of the total global burden of disease. About 450 million people, most of them of working age, are affected by at least one mental health disorder. Importantly, mental health disorders are projected to account for 15 % of the disability burden internationally by the year 2020. Depression alone is projected to account for the second highest burden of disease, following only cardiovascular disease (Scott & Dickey, 2003; WHO, 2001b). Furthermore, mental health disabilities are becoming increasingly common in the workplace. According to the Canadian Community Health Survey, in 2002, approximately one in every five individuals over the age of 15 experienced psychological symptoms over the course of the year, including depression, anxiety disorders, and alcohol or drug dependence (CCHS; Statistics Canada, 2003). Estimates exist that approximately 10 % of the working population has at least one mental health disorder (Dewa, Lin, Kooehoorn, & Goldner, 2007). Given these numbers, it is not surprising that the societal costs of mental health disorders are so high. In North America, the annual societal costs are estimated at $83.1 billion (Greenberg et al., 2003) and, in the European Union, at EU$320 billion (Andlin-Sobocki, Jonsson, Wittchen, & Olesen 2005). Between 30 and 60 % of the costs are losses associated with reduced productivity. In Canada, this cost has been estimated to be C$17.7 billion annually (Lim, Jacobs, Ohinmaa, Schopflocher, & Dewa, 2008). Absenteeism (to be discussed later in this chapter) related to mental health problems accounts for about 7 % of the total payroll (Watson Wyatt Worldwide, 2000). Stephens and Joubert (2001) suggested that the costs to Canadian employers in lost productivity arising from presenteeism (i.e., less than optimal job performance) and absenteeism due to mental health problems are in the billions of dollars each year. Overall, mental health problems have a multifold impact on work, including diminished productivity, absenteeism, presenteeism and short-term disability, increased unemployment rates, early retirement, as well as decreased productivity related to spillover effects on coworkers and supervisors (Dewa & McDaid, 2010). It therefore seems there are significant economic, social and humanitarian reasons to implement workplace initiatives which will reduce the incidence of mental health distress in the workplace, as well as to facilitate the rehabilitation of those employees affected by mental health disabilities (Dewa & McDaid, 2010). 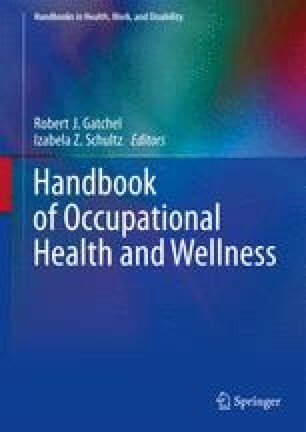 Parts of this chapter were informed by research reports prepared for a Social Development Canada funded project “Towards Evidence-Informed Best Practice Guidelines for Job Accommodations for Persons with Mental Health Disabilities” and published in Work Accommodation and Retention in Mental Health, Schultz I.Z. & E.S. Rogers (eds) 2011; Springer. Mental Health Commission of Canada. (2009). Toward recovery and well-being: A framework for a mental health strategy for Canada, Retrieved from http://www.mentalhealthcommission.ca/SiteCollectionDocuments/boarddocs/15507_MHCC_EN_final.pdf .